Humans are not the only ones who can feel the energy and vibrations that surround us. Animals are a part of our energetic universe and take on the emotions and feelings of their surroundings. Because of this, I am often called upon by owners of animals to help address behavioral issues that are likely grounded in residual energy. This is exactly what was happening with Shari’s two horses, Greely and Pockets. Resistant to training and riding, Shari felt helpless that she would never form a working much less personal bond with her horses. When we first connected, Shari asked me if it is possible for me to be an energy catalyst to horses. I responded it is absolutely possible and we got to work. Through a combination of the energy work found in Feng Shui and the reading our our universal Akashic Records, I was able to immediately tune in to the emotional heart of the horses. Each was storing a unique level of trauma which was residual energy from their previous owners. Greely had his own set of issues and while I communicated and work with him he was able to release the past. He came to an amazing place of peace. On the other end of the energetic spectrum, Pockets was terrified of (his?) previous owners because of prior abuse received while in their care. Pockets continued to look out for those owners and was not able to find peace. I assisted him in completing the trauma assuring him that the previous owners would never be present again and would no longer be able to cause any further pain nor harm. 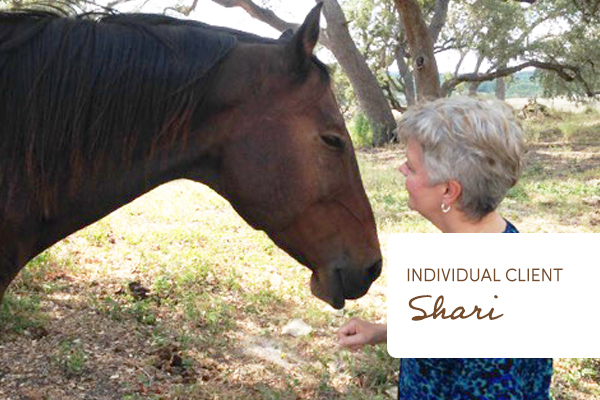 Because of the Feng Shui energy clearing and the accessing of the Akashic Records, both horses immediately transformed into happier, healthier animals resulting in a closer bond with Shari improving their relationship through training and riding. Like many other clients, this initial session has grown into a lifetime of work with Shari. As a result, I have worked with her in life coaching, hand analysis and maintain an on-going relationship of care.